Yay, it is TGIF. Thank goodness it's Friday AND thank goodness I'm Feline! Happy Halloween as well. I don't plan on wearing a costume of any sort, but mum is warning me that lots of little beans will be coming to the door tonight looking for candy. She told me I can chill out in the sleepy room while she is busy with them. Otherwise I don't think we have much planed for the weekend. We can snuggle, find the hour we lost. Mittens says it just hides inside the clocks! Since it has gotten cold, no more flower fridays. But here is one last one from the summer season a flower and a butterfly. Happy Weekend. 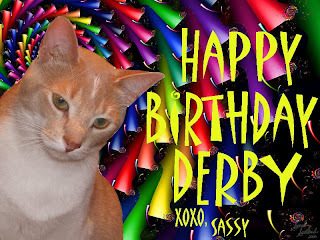 I'm Derby and I approved this message. I have all of the qualifications to be vice president. 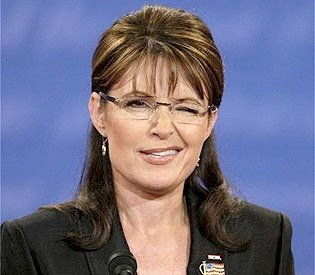 I can wink too, just like that Sarah person. The day is fast approaching for the election. If you are eligible to vote in Mericky, get out and do your patriotic duty. Vote next Tuesday, vote absentee ballot or vote early if your community allows it. You can't complain afterwards if you don't vote. Well since we have had our various operations we can hang out with each other. I suppose our beans wouldn't let us hang out together if we hadn't. We would be making kittens left and right . Mum is hating getting up these mornings. Says it is just too dark when she has to get up so she can go to work. Says five more days of getting up in the dark, then the time will switch. Is this where Patches has to help us find the hour we lost in the spring? What a week! 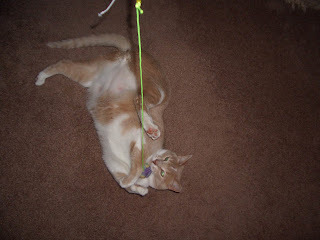 I sure had fun with my purrthday party on Monday. 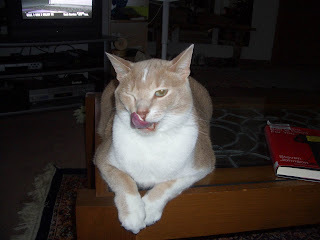 Tocktober fest was a big hit with the cats and buns and a few woofies across the blogosphere. I think we are going to chill out this weekend. Mum doesn't appear to be making plans for anything major to be going on. That means we can just snuggle this weekend. 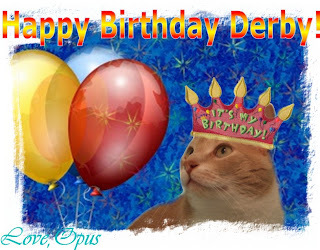 In addition to all of the visitors on Monday for my purrthday, I got a couple of e-cards from Sassy and Opus. Thanks you two. Plus when mum got home from working their was a box address to both me and mum. My buddy Fat Eric sent me some goodies for sending him Greenies. Here is the box where mum sat it down while she got the flashy box ready to take pictures. It was filled with all sorts of goodies, toys, treats, sweets for mum. Even a couple of what mum would say would be Christmas tree decorations. The catnip tea is for kitties. It says to brew it with hot water, then cool it down for kittie to drink. It can't be that good of nip. Mum left the box out on the counter and I haven't messed with it. What is cute is that the 'teabags' are in the shape of a mouse. When mum makes it for me I will let you know how it is. Floof from Eric. Mum laughed at this. Just what she needs, more cat hair around the house! Some of the treats, little cheese balls for me. Mum only gives me three at a time. Sweets for mum, she likes these and you can't buy them here in Mericky. So she rations herself to not eat them fast! Maybe one a week. It took me a couple of days but I think I made it around the CB to say thanks for coming to my party and to check out the 'tocktober pictures. I hope I didn't miss anyone, I enjoyed having everyone stop by. Wow, what a party! Thanks to everyone for stopping by. I gotta rest up some since I didn't get all of my naps in yesterday with everyone stopping by. I am slowly working my way through the blogosphere checking out everyone's 'tocks pictures. I did get a nice prezzie from mum, she actually made it home on time on Monday and a full can of stinky goodness. A big thanks to Fiona and Orlando for starting is TOCK-TOBER FEST! They have a great picture up of me and the buns bums! ManCat Monday - Happy Purrthday to ME! Mum found this little tidbit of information. In 1930 the life expectancy of a house cat was 8 years and now it is 16 years. This is due to better veterinary care and the fact that most of us live only inside now. So at just being 5 years old, if things work out, I am just about 1/3 of my life gone. I got lots of time to be with mum and hang out with all of my furiends. 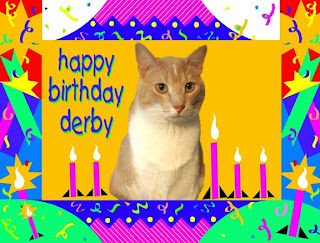 Thanks Zoolatry for the cool graphic for me on my purrthday. Plus my NOMSSF Fi and Lando have said today is 'Tocktober-fest' in my honor! Thanks guys! Please leave a comment if you stop by, espeically if you have a post for 'Tocktober-fest". I want to be able to come by and see your posts. So here is a nice picture of my 'tocks! Show me your 'tocks! Our buddy Tiki went off to The Bridge. Have fun my furiend, you are healthy and free from pain. Your family and furiends will miss you, but you are in a better place. Mum planted seeds for moonflowers this spring, she planted them with the morning glories thinking she could have flowers all day and night long. Well the morning glories have been blooming for about two months. Blooming better now than they have all summer long! Mum noticed some different flower buds in the past weeks and guess what? We finally got a couple of moonflowers to actually open up. Mum has pictures. They aren't the best since she had to use the flashy on the flashy box, but at last mum says. She came home one night this week late from work as usual, then ran off to do errands. When she came home it was dark, but the flower had opened. So she came in to get the flashy box. While mum is not as brain dead this week on Friday as she was last week, she is still tired. She is sort of keeping up with stuff, but coming home later than she used to. Says once she gets her project done, hopefully in the next few days, she won't be there so late! Mum's cousin set her this. Let's all do this and help raise green papers to help out our beans. The pink page is live at www.catchow.com/pink. Take the free 5 questions survey about breast cancer awareness and in exchange Purina will donate $1.00 to the Susan G. Komen for the Cure in your name, or in the name of a friend of loved one. Let's make a difference - forward to your friends. Mum also saw this on the news a few weeks ago about The Army of Women.org. They are a research group who want to enlist healthy women who do not have breast cancer to study to see if they can pinpoint the differences of those who get breast cancer and those who do not. Please check this out and consider participating if you can. The Love/Avon Army of Women offers women the opportunity to partner with the scientists who are conducting research that will end this disease--once and for all.Breast cancer has been around for decades, but it does not have to be our future. We can be the generation that stops breast cancer once and for all by figuring out what causes this disease and how to prevent it! Sign up for your sister, mother, daughter, granddaughter, best friend, and the woman you met last week. This is YOUR chance to be part of the research that will end breast cancer.It takes a just a minute to join. But the impact we will have will last a lifetime.Please Join Me in Being One in a Million! Mum signed up, she has several furiends who are breast cancer survivors, so would love to help find a way to fight cancer so people don't get it in the first place!. A cat can climb down from a tree without the assistance of the fire department or any other agency. The proof is that no one has ever seen a cat skeleton in a tree. - Unknown We had a wonderful weekend here. Warm enough to have the windows wide open. I took advantage of it while mum did some stuff outside. Getting all sorts of sun on my furs and smelling the wonderful air. So a trifecta for the weekend! Mum tried to rest up this weekend, did what work she had to, rug sucking monster, washing and all, but otherwise didn't over do it. It was a nice weekend, probably one of our last warm weekends, so we could have the windows open and all. But she is sniffly, sneezy and coughy a bit too, so she did try to rest. She brought Grampie over after lunch on Sunday. Since it was nice he headed outside to sit on the patio, and I followed right along! I could slip around his legs faster than mum or he could catch me! So I had a few minutes outside in the grass again! Mum got the flashy box and took a few pictures of me. When I got too close to the fence, mum would turn me so I would wander back towards the inside part of the yard. I chewed a little grass, but didn't yak it back up. Checked out some other little plants in the pots, just maple trees the squirrels planted. Then checked out some of the leaves that are falling from our little maple tree in the back. Maybe, just maybe, since I have been pretty good when I have gone outside, mum will let me out out now and then! I sure hope so. 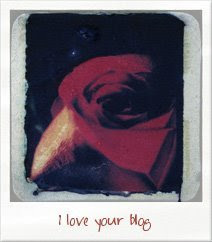 Alasandra and The Cats awarded me this nice "I love your Blog" Award. Thanks. I will have to think who to pass it along to. Mum did help me so I could enter the Frisky Fall Contest. A donation is made for each entry to help needy kitties. So do something to make an entry, however simple, to help out. Yes we made it to the end of the week. Mum is really happy to see the end of the week. Even though she only had to work four of the five days, she has been furry busy. She is coming home a bit later now. Says she has to get the work done on her own, seems they kicked the other guy out for not doing a good job! So mum comes home, we snuggle, she eats something quick, we check a few blogs, then mum says she is brain dead. Then she just wants to sleep or veg out if it is too early for bed. So if I am not around much for a while, you know why. Mum's brain died and she can't help me here. I see that Mike, Mike the Lonely, he calls himself is looking for a girl cat friend to love. Well maybe he would like to meet this little sweetie that mum brought home. Want to meet her Mike? This was to be his dare that Karl had from The Cat Realm but he can't wait for the rest of the dares to come out. Woohoo, I am back! Rested and snuggling with mum. She went waaaaay up north in Whiskerconsin with Grampie to visit this place. Stayed in this tiny little house. Where they had way more water than I would want to mess with! Mum said she used to go their as a little one with her family to chill, so she and Grampie went to chill. No TV, puters, no 'lection stuff etc. Just peace and quiet, pretty trees and seeing a place she last saw, many, many years ago. She got back and picked me up this afternoon, since then I have been getting my snuggles and all from mum. She has been busy using the laundry monsters in the dungeon. Tomorrow she says she will be back to reality with work. While I did some resting I also hosted BeauBeau while his beans went to the Packer game. Sorry they lost BeauBeau, but it isn't going to be their year! We had fun anyway.